Sometimes I think I should make a “Find a Book Boyfriend” quiz for my catalog. Want to win a $250 Amazon Gift Card and a gift basket of books? Two runners up will also win $25 Amazon Gift Cards as well. I’m a huge video game nerd and one franchise I always come back for is Assassin’s Creed. Ezio, Edward, Bayek, and — that cheeky British monkey — Jacob Frye. I’ve played through Syndicate four or five times already, but each time I pick it back up I’m hooked. The sneaking, the plotting how to execute your goals, the biting wit. And the fight clubs are a great way to work off some frustration. Do you have any video games you return to over and over like a favorite blanket? It’s freezing cold and snowing for the tenth weekend in a row. To entertain the dog, I got her a giant banana toy. Should take her a half hour to fully rip that toy to shreds. You can get my first YA fantasy novel The King’s Blood for free along with twenty other fantasy books. My dog is a highly skilled present opener. 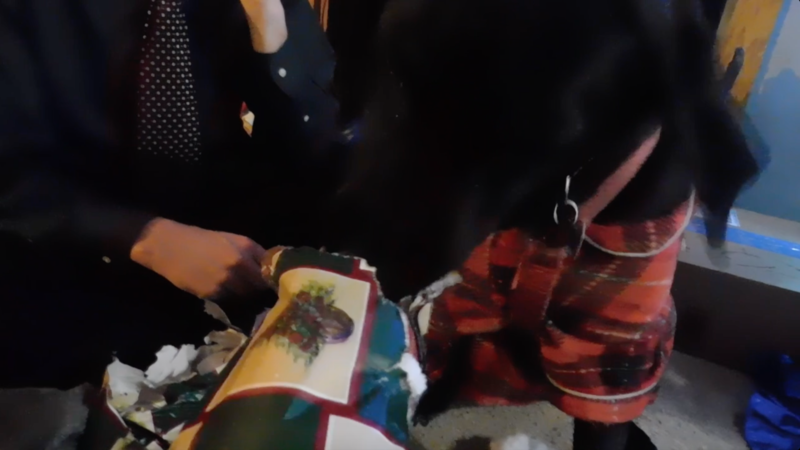 If she doesn’t get to rip up wrapping paper for Christmas, she’s very mad.